Casio Ladies LA680WEA-1BEF Silver Tone Steel Strap Digital Watch. Stainless steel stainless steel bracelet. Slide clasp. Digital display. Black dial. Easy to read dial. 5 out of 5 stars - Casio Ladies LA680WEA-1BEF Silver Tone Steel Strap Digital Watch. 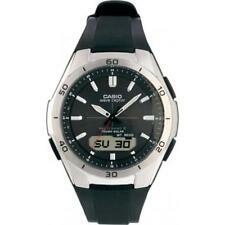 3 product ratings3 product ratings - Casio Ladies LA680WEA-1BEF Silver Tone Steel Strap Digital Watch. KAHUNA MEN SPORTS STYLE ANALOG-DIGITAL WATCH . Condition is Used. Dispatched with Royal Mail 1st class Model NumberAKUV-0003G RRP: £39.99 Other Details: Reliable Quartz Japanese Combo Analogue & Digital Movement Highly durable Blue Rip Tape Nylon / PU Strap with webbing. Day/ Date Useful Stopwatch Alarm Function & Back light/ Light up numbers. 50 Meters Water Resistant (5ATM) Case Diameter (Approx): 42 mm Case Thickness (Approx): 14 mm Strap Length: Standard, Width 22mm approx Numbers on fixed bezel feature have slight fading. Please see pics No Gift box included Please feel free to ask any questions, I’m happy to send additional photos if requested. Casio Men's Power LCD Digital Smart Watch - Black. 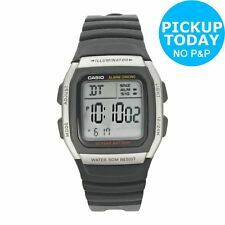 4.5 out of 5 stars - Casio Men's Power LCD Digital Smart Watch - Black. 43 product ratings43 product ratings - Casio Men's Power LCD Digital Smart Watch - Black. Casio w 753. Includes alarm, stop watch and back light. Shatter-resistant plastic window lens. We are a Pulsar UK authorised dealer. Pulsar are part of Seiko. 99-hour chronograph accurate to 1/100 second. Hour, minute, second. Band - Black leather strap. Material - 43 mm Stainless steel case and screw case back. LED backlight for the digital display (Full auto LED light, selectable illumination duration, afterglow). WVA-M640D-2AER, WVA-M640D-2, WVA-M640D, WVA-M64, WVA-M6, WVA-M, WVA, Casio Watch, Watches, Waveceptor, Casio Collection. • Date Display, Alarm & Databank. • Casio box with booklet. High quality sports looks, back by a rich feature set, define the new SGW400 Twin Sensor from Casio. 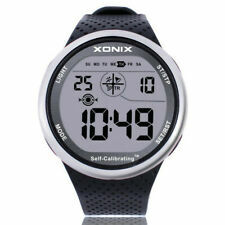 These features make this watch useful when hiking, mountain climbing, or when engaging in other such outdoor activities. Accurist Men's Grey Stainless Steel Chronograph Watch. A small watch. May need a new battery. Water resistant. Sport watch. Red, white and blue in colour. Lorus R2333DX9. Lorus watch by Seiko. Black rubber strap with stainless steel buckle. Sports design gents watch with grey resin case. Gents Sports Style Watch Black Strap. Brushed steel finish bezel with ten minute markers. The item is LIKE NEW. May have been on display and may shows signs of handling. Award-winning Eco-Drive technology converts the power of light into energy. Watch feature. Strap style. Model number. Face shape. 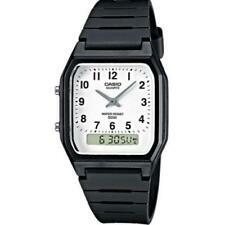 Casio Ladies LA680WEA-1BEF Silver Tone Steel Strap Digital Watch Condition is New with defects. Outer box has some storage wear mainly in the edges and corners as shown in the pictures, all contents in new condition Dispatched with Royal Mail 2nd Class. Timex Expedition Grid Shock Mens Watch TW4B02500. 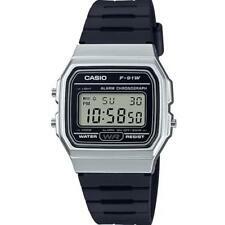 Casio Watch. CASIO EDIFICE. CASIO SHEEN. CASIO G-Shock. CASIO Baby-G. CASIO PRO-TREK. 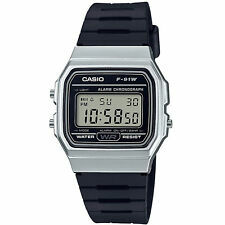 Casio Clock. Total weight : 21g. Chronograph Sports Watch- Brand New Globenfeld Stunning! Watch back light function for night vision. Stop watch. Platinum 5 Year Warranty. Needs battery, Not wore anymore. The large 44 x 16mm rose stainless steel case is in direct proportion to all the features of this modern Pulsar watch. Water resistant 100m. Dress Rings. Cufflinks, Tie Tacks & Slide. Other Hide all sub-categories. Chronograph Sports Watch from Globenfeld-Stunning-New! Globenfeld A uk Watch maker. Watch back light function for night vision. This is a stunning watch. Stop watch. Original Box. Weight: 141.2g. Thickness: 15mm. Contains 5 crowns, beautifully designed with textured finish for easy-touch settings. Stainless steel case. Polyurethane bracelet with buckle closure. Round face. Rotating bezel. Display case included. Citizen Skyhawk A-T JY8051-08E is an amazing and special Gents watch. Case material is Stainless Steel, which stands for a high quality of the item and the Black dial gives the watch that unique look. Model number pq2055x1. Classic design is paired with digital functionality with this Pulsar multi-function digital watch. The stainless steel bracelet watch is also water resistant to 100m. The watch has a date function. Timex Mens Expedition Rugged Indiglo Watch T46681. Perfect for any outdoor activities the AWG-M100 holds both the technology and tough exterior that G-Shock is so well known for. With Multi Band 6, Solar Power, Shock Resistance and 200m Water Resistant, this watch is perfect for the persons who like to venture out. CASIO ILLUMINATOR, 10 YEAR BATTERY LIFE, ALARM CHRONO. ALL THE FUNCTIONS ONE WOULD EXPECT ON A CASIO DIGITAL WATCH. Stopwatch:1/100th Sec Stopwatch. Illuminator:An electro-luminescent panel causes the entire face to glow for easy reading. Argos will then notify you when your order is ready for collection. Model Number PQ2056X1. Stopwatch Yes. Gift Box Pulsar. Special Features Backlight. 5 channel alarm. 24 Hour Counter Yes. 50m / 5 ATM A watch with this level of resistance is wearable around household sinks, while playing sports and while swimming in shallow water. Dress Rings. In low light conditions the face automatically lights up when tilted and at a push of a button the hands move aside to allow viewing of the digital screens. on all orders over £19 add us to your favourite. Analogue and digital display. The silicone strap ties everything together to make this superb Ana-Digi watch. Henley presentation gift box. 1/100 second chronograph with split functions. blue silicone sports strap (approx 20mms wide near buckle x 23.5 cms long). 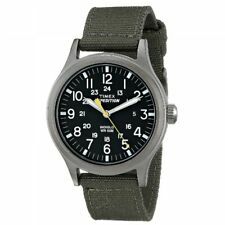 Timex mens T49961 expedition Scout Green watch. Very large clear dial. Dial in good condition with a few light scratches. Case is 39mm across excluding crown. 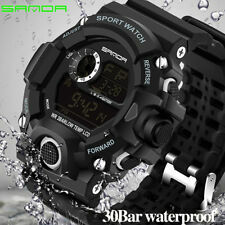 Waterproof 50m. (ISO 2281). — Stopwatch function – 1/100 sec. —Accuracy – /- 30 sec seconds per month. For Mixed Gas Diving. Screw-Back Case and Screw-Down Crown. Mineral Glass Crystal. Zippo Lighters. RRP £140.00 Our Price £91.95. Casio Solar Powered Strap Watch. Official Casio Agents we have a large range. LED backlight for the digital display (Full auto LED light, selectable illumination duration, afterglow). VERY GOOD CONDITION AS YOU SEE IN THE DETAILED PHOTOS. AGE7TH APRIL 2018. WARRANTYUNTIL 07/04/2020. Timex Men Grid Shock With White Resin Strap Watch - Cool Large Watch Look !! !